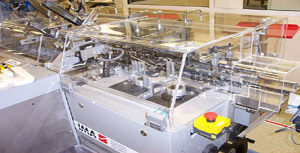 Most machine guarding and safety guarding are made to spec supplied by the customer. The most common materials used are Lexan (Polycarbonate) Acrylic, PVC, Styrene, PETG, PP and PE. We cut, mould, bend, bore, glue and assemble guarding for a variety of machinery including, tote boxes, shadow boards and sneeze guards.